Following the American Civil War, Hartford was the richest city in the United States for several decades. Today, Hartford is one of the poorest cities in the nation with 3 out of every 10 families living below the poverty line. 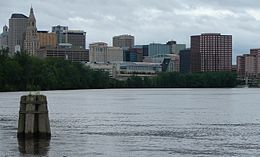 In sharp contrast, the Hartford metropolitan area is ranked 32nd of 318 metropolitan areas in total economic production and 7th out of 280 metropolitan statistical areas in per capita income. Highlighting the socio-economic disparity between Hartford and its suburbs, 83% of Hartford’s jobs are filled by commuters from neighboring towns who earn over $80,000, while 75% of Hartford residents who commute to work in other towns earn just $40,000.